The radio button is another control in Visual Basic 2010 that allows selection of choices. However, it operates differently from the check box. While the check boxes allow the user to select one or more items, radio buttons are mutually exclusive, which means the user can only choose one item only out of a number of choices. Here is an example which allows the user to select one color only, as shown in Figure 18.1. Although the user may only select one item at a time, he may make more than one selection if those items belong to different categories. For example, the user wishes to choose T-shirt size and color, he needs to select one color and one size, which means one selection in each category. 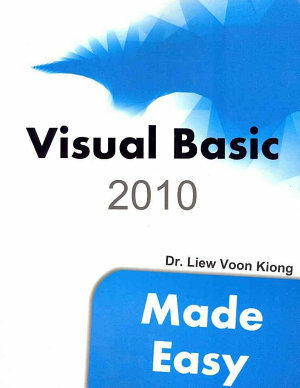 This is easily achieved in Visual Basic 2010 by using the Groupbox control under the containers categories. After inserting the Groupbox into the form, you can proceed to insert the radio buttons into the Groupbox. Only the radio buttons inside the Groupbox are mutually exclusive, they are not mutually exclusive with the radio buttons outside the Groupbox. In Example 18.2, the user can select one color and one size of the T-shirt.